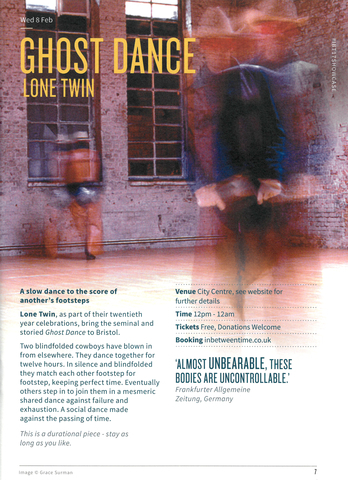 Lone Twin bring their seminal Ghost Dance to Bristol as part of their twentieth year celebrations. For two decades the duo have been making work that is characterised by hope and compassion. Making early work that was sometimes arduous and physically demanding, they were surprised to find that people gathered round and tried to help. Ever since that is what they have been doing – encouraging people to gather round.